Discussion in 'The Lounge' started by blue, Sep 8, 2010. Might be one of my better ones. 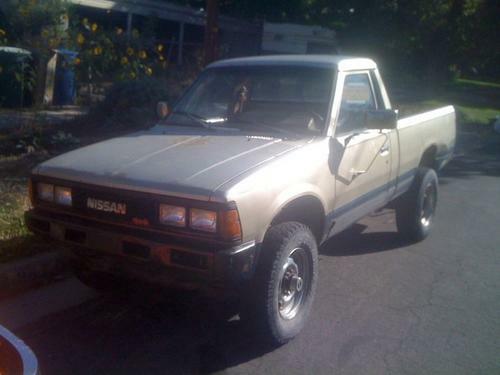 1985 Nissan 720 4WD pickup. $400 can't really be wrong. Needs a few items, but nothing awful, plus it's a breeze to work on compared to the Porsche 944 I've been wrenching on for awhile. Anyone here have experience? Need to fix a couple more pressing electrical issues before it passes inspection (turn signals and speedo). Was going to be said so , got it out of the way. Get it fully functional and it will be good for what it's needed for. IF those still used the KA motors, then they are pretty much a breeze to work on. Except the hardware oon that engine is ****. Don't be surprised when you snap a couple bolts. But, it was a good find anyway. Those engines have tons of torque. PM the montashu. I hear he's a genius when it comes to old clapped out vehicles. PM the montashu. I hear he's a genius when it comes to clapp. No - It has a 2.4L Z24. I think a KA is an easy swap, though. those are good little pickups. mileage? hell at $400 who cares!? You should do it and get a turbo kit for the KA. Everyone who owns a 240sx wants to get rid of their KA motor and get an SR20. So finding one for cheap should be easy. But the engine you have to work with now ain't half bad. It will get you around, but as far as stock power goes and living in San Francisco it might be a bit of a burden with all of those hills. Live in SLC. This will be the winter commuter barge/Moab truck. No turbo kits, thanks. It has enough tq to get up hills. I might just go for a straight six Z-car engine if this one ever bites the dust. Driver side door lock cylinder is gone. VERY tempted to bolt a padlock gate mount to it. im sure a lot of eastern european and the countries from the soviet block all have crazy cars floating around, no? gold in this thread....it will come. the only thing i can recommend is to beat the sh*t out of it and not really care. when it dies.....stick rag in gas tank....lite....walk away. Sir... that there is style.. pure unadulterated style. Not bad if you can get it up and running. This needs 33's, a bunch of stickers, and a dakine bike pad. Don't forget some crappy metal from the under powered stereo. is that your child catcher in the background? My dad used to have those aftermarket side mirrors on his Ford Courier. I think the HG is gone - thought the waterpump gasket was leaking (it was). Fixed, but as soon as it got warm, spewed coolant and overheated. dozens of trucks just like around here...they're used by the drunks who can't afford a mopad. Pulled off the valve cover today. Realized that the headgasket wasn't leaking, but the waterpump itself was actually hosed and just throwing coolant up against the engine from the nether regions. Fixed! Now, more pressing matters: Whoever's owned this jalopy before me ripped the steering column out and put it back in in a very haphazard manner, thus, the horn, dash lights, and indicators don't work. It needs new indicators anyway, and I'm afraid that when I dig into the wiring I'm going to discover a sh!tstorm of redneck 'lectrical engineering. If/when I do, I'm considering going full Dukes of Hazzard and just mounting new indicators/horn switch/dash lighting with my own switches (perhaps in a console panel manufactured from a Wheaties box). Are there some good mail-order resources to pick this sh!t up? Autozone and the like get spendy when you start buying lots of crap. Every day with this truck is like a Top Gear challenge. I think I'm in love. Everything you ever wanted for that rig is at JC Whitney. The engine is sh!tting the bed - piston rings seem to be fvcked. That+it needing new tires is leading me to the logical conclusion of pushing it off a cliff. 280Z straight-6 motor (L28E) is almost a drop-in swap aside from an electrical fan setup, but that+tires has me seeking other sh!tty vehicle pastures.